Looking to cook in style? 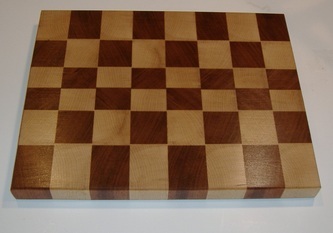 How about with a handmade chef style end grain cutting board. These boards are made from a combination of solid hardwoods in a variety of patterns. 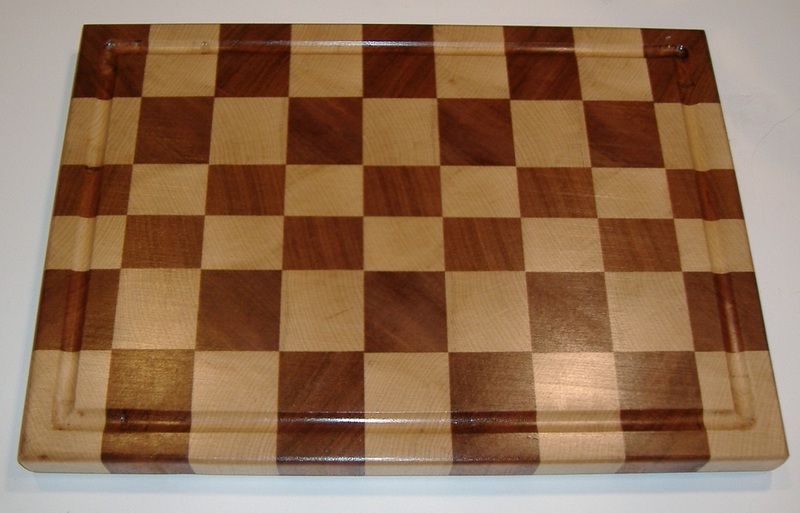 We offer them in 2 sizes small: 13" long, 10.5" wide, 1.25" thick, and large: 18" long, 12" wide, 1.25" thick. Each board comes with hand holds in each side for easy lifting and carrying and an optional liquid groove on one face. 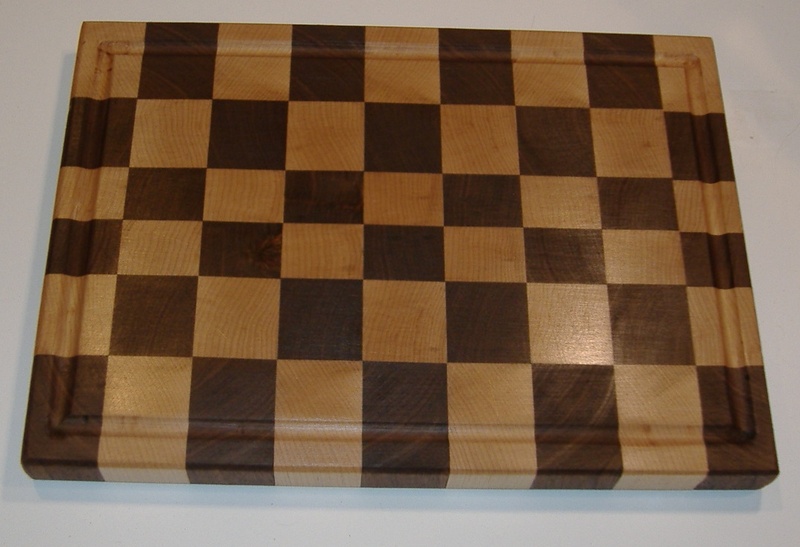 Use one side for cutting and the other for serving, or one side for meat and then other for vegetables – whatever suits your needs. 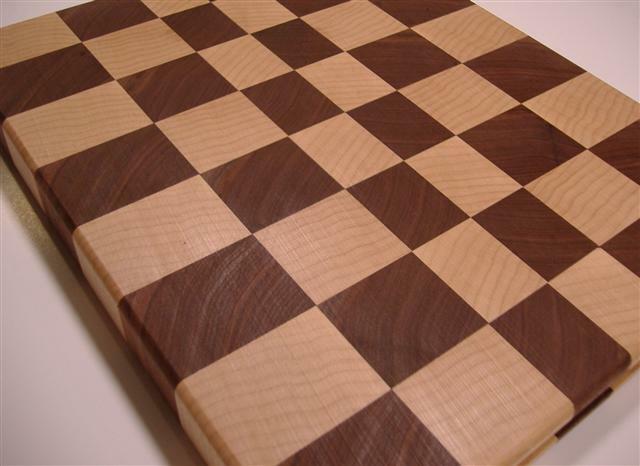 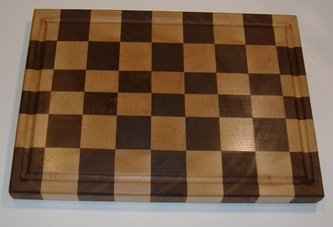 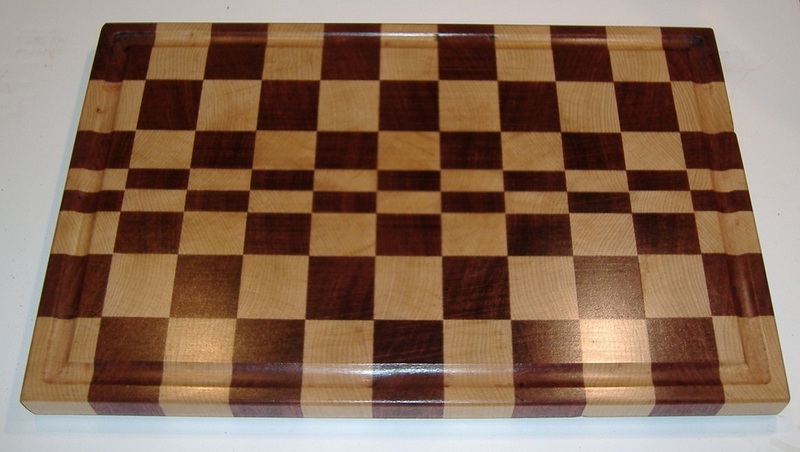 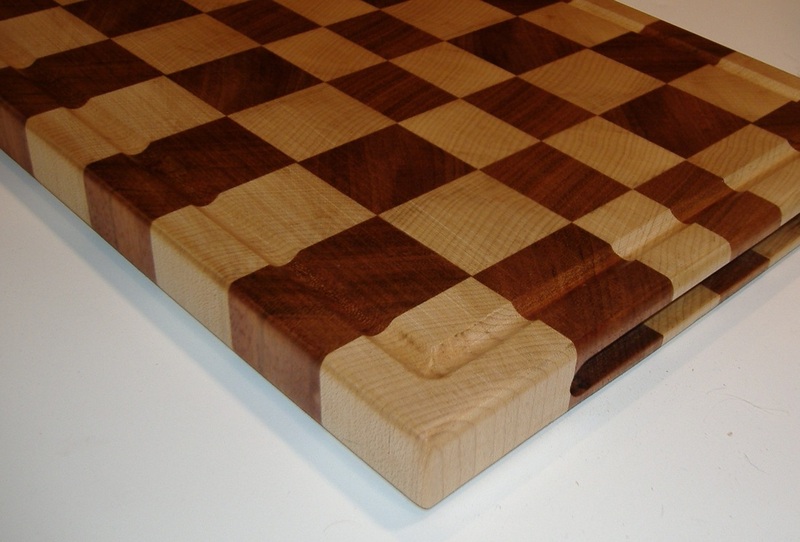 Each board is finished with your choice of food safe varnish or oil finish. 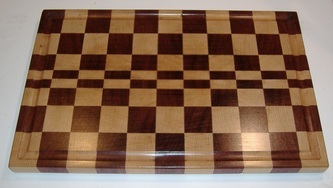 Check the bottom of the page for pricing information. 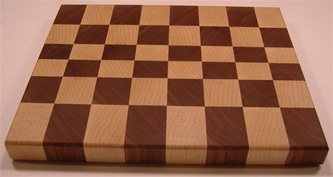 Want one of your own?? 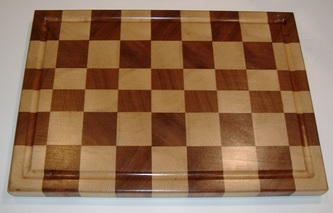 As always we can make one custom for you in any size you need and with any combination of wood. Large cutting boards start at $138 + $20 for the optional liquid groove. 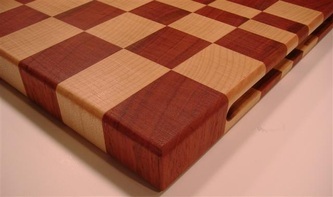 Small cutting boards start at $93 + $15 for the optional liquid groove. 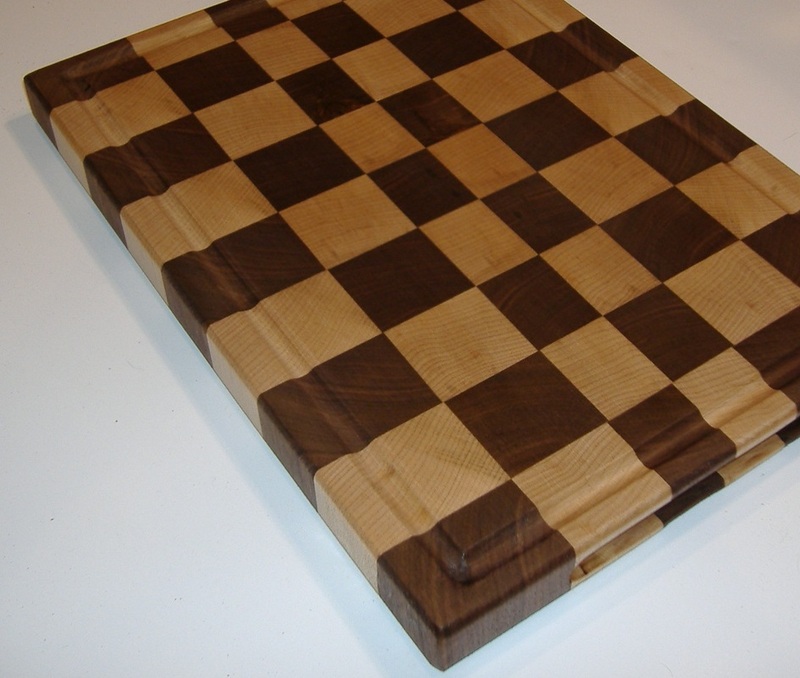 See what is in stock on our Etsy page or Contact us for your custom order today! 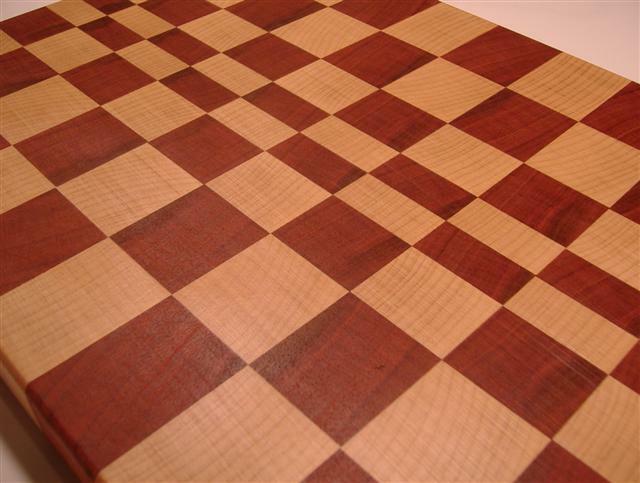 There are several distinct advantages to a end grain cutting surface as opposed to a long grain surface. 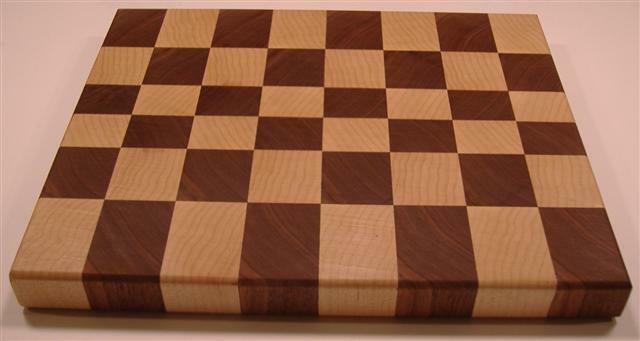 Not only do they look beautiful but they are the supreme cutting surface used in butcher shops for centuries. The surface is much harder and more durable than regular cutting boards and resists knife marks as well as keeping your knives sharp longer. 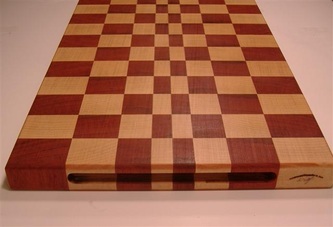 A regular cutting board with the grain running the length of the board will soon show signs of wear due to the knife edge severing and crushing the wood fibers. 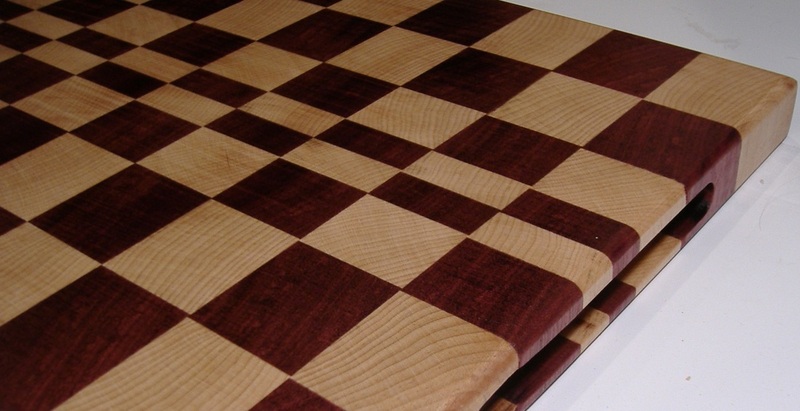 Some of the wood grain may even break loose and splinter creating a rough porous surface serving as a hiding place for bacteria. 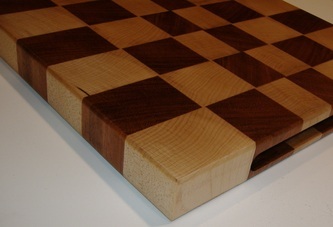 With a end grain board the wood fibers are standing on end allowing the knife edge to pass between the wood fibers there for extending the life of the board.